This issue, along with our usual reviews, inspiration and regular Q and A sections, we explore the rapidly growing area of architectural visualisation. With a mix of features, interviews and training, you'll soon be on the road to mastering your own archviz projects. In this feature, we take a good look at this growth area, talking to leading industry figures, including Jeff Mottle of CG architect. In this tutorial, industry expert and product manager at Insydium, Mike Batchelor, shows you how to create awesome viscous fluid sims. ZBrush expert Maya Jermy shows you how to get to grips with the hard surface toolset to create a gift box model. 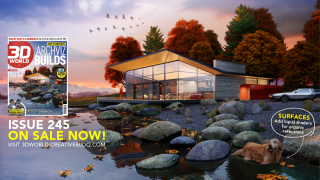 Recreate our cover image by following veteran artist Carlos Lucio, who shares his process for building archviz scenes. Ian Failes takes a trip to Marwen, getting the lowdown on the latest tools and techniques for virtual filmmaking.